Magic and mystery promised in Charlie Cake Park | West Leeds Dispatch | News. Views. Get involved! 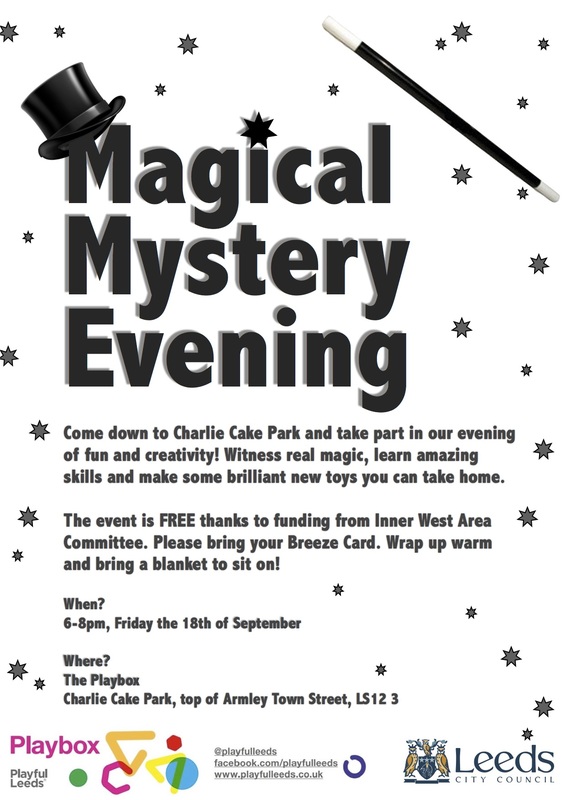 Magic and mystery are promised in a special fun evening in Armley’s Charlie Cake Park on Friday. The Magical Mystery Evening will give youngsters the chance to learn magic tricks and make new toys to take home. It runs between 6pm and 8pm at the Playbox container in Charlie Cake Park, at the top of Town Street. The free event has been organised by Armley resident – and the brains behind Playbox – Emma Bearman and supported by the council’s Inner West Community Committee. Attendees should bring their Breeze card. Playbox is also running a workshop on Sunday to make beautiful ceramic tiles to cover the concrete benches in Charlie Cake Park. The event runs 12-2pm and is free, but do bring a Breeze Card. A Cha Cha Cha finale party, which was due to be on Sunday, 20 September, has been moved to an October date when Playbox will announce its next destination on its winter travels. Playbox has been running events in Charlie Cake Park throughout the summer. It’s a mini venue in a shipping container creating play (for all ages) in an area where there was very little.